Thank you, Erika, for posting your beautiful Shih Tzu for all of us to see. You have done a fantastic job with her grooming. Keeping a Shih Tzu in a coat like this requires a lot of work, especially when you have a dog that has a thick coat. Ask me how I know? Well Tulip's sister, Cherry lives with me. We decided to hold on to Cherry for breeding purposes, and both of the girls were similar in color and coat texture. 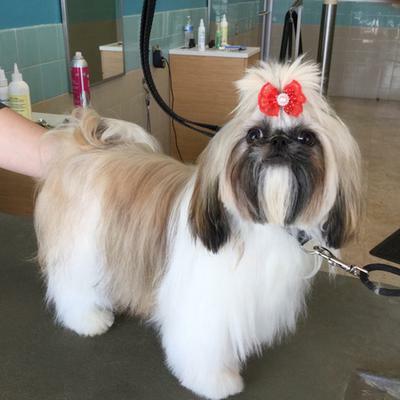 For anyone who wants to keep their Shih Tzu's coat in such great shape, you need to know that you will need to devote plenty of time to brush, comb and bathe their dog. Daily brushing is best, but at least every other day is essential to prevent tangles and mats from forming. Thanks again Erika, for posting your dog's photo. And, thanks for being such a great Tzu parent.